A furious resident threatened to kill an elderly woman who kept using her access-only road to walk her three dogs. 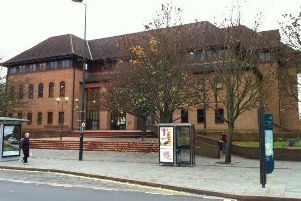 Chesterfield magistrates’ court heard on September 12 how Helen Hunt, 32, of Park Street, Ripley, abused the female pensioner as she was walking her dogs near to Mrs Hunt’s home. Prosecuting solicitor Sarah Haslam said: “The defendant lives on an access-only road and there are issues with people walking dogs along that section of the road and passing the home address of the defendant. “The day before the offence there was a previous incident with someone walking a dog and that was dealt with separately. The defendant had been driving and was outside her home and told the dog walker she was going to run her over and kill her and also run over her dogs and kill them, according to Mrs Haslam. A witness who intervened in the dispute revealed that the dog walker was aged in her 80s. Hunt told police she had been upset and had told the dog walker that she should not be surprised if she or her dogs ended up being run over and it was not a direct threat. The defendant added that she understood that the complainant had already been told not to walk down the road after the access issue had been previously addressed with the authorities. Hunt pleaded guilty to using threatening behaviour. Defence solicitor Ande Hunter said Mrs Hunt is of previous good character and the offence was completely out of character. He explained the road involved is narrow and only allows access to drive to properties but the complainant walks her dogs on the road in a very slow manner. Mr Hunter claims that Hunt had been driving to get home the day before and the complainant was in the middle of the road and she had sat on her vehicle refusing to move. He added: “The next day the complainant was walking her dogs in the middle of the road and Mrs Hunt went outside and made this stupid and rash comment. Magistrates sentenced Hunt to a 12 month conditional discharge and warned if she commits another crime in the next year she will be re-sentenced for the offence of threatening behaviour. She was ordered to pay £85 costs and a £20 victim surcharge and given a 12 month restraining order not to contact the complainant.